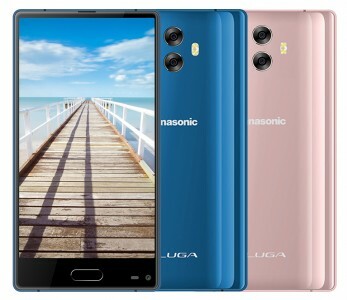 The Panasonic Eluga C flaunts a 3-side bezel-less design similar to Sharp’s Aquos phones and Xiaomi’s Mi Mix. It is not a flagship though, instead it aims for the lower segments with a price (in Taiwan) of TWD 6,000 ($200 / €170). The phone has a 5.5” screen with a screen to body ratio of 84.6%. The resolution isn’t great – 720p – but the brightness is pretty good – 450 nits. Below the screen is a fingerprint reader (0.3s unlock time) and an 8MP selfie camera. Around the back there’s a dual 13MP + 5MP camera. Both it and the front camera use f/2.2 lenses. The MediaTek MT6750T chipset limits the video capture to 1080p/30 (it’s a relatively old 28nm chip). The memory situation is better – 4GB of RAM and 64GB storage. There’s a microSD slot if you need more, though it's unclear if the dual-SIM slot has a dedicated spot for it or you get to pick between more storage and second SIM. Anyway, the Panasonic Eluga C has a 3,000mAh battery and comes with a slow-ish 7.5W charger. It is currently on pre-order in case you are interested. We will see how "bezel-less" this bezel-less-design will be ... like VKWorld Mix and Doogee Mix ... or like real bezel-less!